Couple that with a sore throat and the anticipation of upcoming weekend travel and festivities (we flew to Louisiana for my cousin’s wedding), I decided it was best to just throw in the towel. I wasn’t giving up wheat for any ‘important’ reason, such as an allergy, and I didn’t want to experience any sort of GI distress should I begin eating wheat while out of town. So, I promptly ate a cookie. I’m back to eating (somewhat) normally, although being out of town always seems to wreck havoc on my diet. -Last Sunday was the first day I felt almost totally fine eating wheat free. While a bit fatigued on my morning run, otherwise I felt fine. Upbeat, energy and no cravings for anything. On the positive side, I now have a personal experience from which to draw on when I counsel patients/clients about wheat-free and no/low-carb diets, as well as a greater understanding of what it’s like to be on a special diet for bona-fide allergies or intolerance, such as a gluten-free diet for those with Celiac’s. I also have a desire to make sure the grains I am consuming are WHOLE grains, not just ’empty calories’ like those found in pretzels or some crackers and things. I’m looking forward to getting back on track with a normal diet and exercise once this cold passes. Well, this week has been interesting. I’ll keep my observations of going wheat-free thus far brief, as the rest of this post focuses on the recipes I’ve tried out. Difficulty in finding things to eat: Almost no trouble at all. I already eat a lot of veggies and am very open to experimenting with new foods and recipes, so it hasn’t been hard to come up with things to eat. Fullness/Satiety: Perhaps the most shocking side-effect of this experiment is how little I’ve been snaking. Normally, I eat about 350-calorie meals, with a couple 200-calorie snacks throughout the day. This week, my meals have been a bit higher in calories (closer to 400) with almost no need to snack in the afternoon. Seriously. I’ve been absolutely floored at how full I’ve felt from lunch to dinner. I don’t know why I’m surprised; it’s the fat that leads to satiety and protein that increases how full you feel/takes longer to digest, both of which have increase in my diet. So, it makes total sense. Couple that with the fact that I’m eating more foods that don’t spike my blood sugar as much, which probably leads to a more even level of glucose in my blood throughout the day, thus decreasing those episodes of lower blood sugar between meals. If I take anything from this experience, I think it will be to add a bit more healthy fat and protein to my meals. Weight-Loss: ZERO. (Not pleased.) I’d anticipated a bunch of quick ‘water weight’ loss, but that hasn’t happened at all. It could have something to do with increased protein intake, or my body adjusting to the new diet. Energy Level: LOW. The first day or so seemed normal, but every day after has been tough. My workouts have definitely suffered, and I find I’m winded after doing simple activities. It’s not like I can’t take the dog on a walk or run or even swim, it’s just harder. An even neater observation is that for the first minute or so of an activity, I feel great. But after that, it’s like I crash and feel like I’m running with bricks tied to my feet. That’s happening because I’ve depleted my glycogen (the form carbs take when they’re stored in your muscles) stores have been depleted. The first minutes of exercise get energy from what’s quickly available in my blood, while exercise after that reaches for those stores, which aren’t really there anymore. SO INTERESTING. Carb Intake: About 1/2 to 2/3 of usual. I’m not aiming for no/low carb (that’s just unwise, in my opinion), but by taking out wheat and other whole grains, it’s inevitable that my carb intake will decrease. Our brains need a minimum of 130 grams a day to function, and I think I’m coming in somewhere around 175-200 grams. My recommended intake is about 250 grams. Brain Function: I’m definitely not firing on all cylinders lately. I can’t say it’s a huge difference, but I definitely just feel a bit ‘slow.’ It’s not drastic and it’s not like I couldn’t take a test or study, but I’m just a bit off. -I’m probably going through a ‘withdrawal’ phase. It’s mentioned in the book and because I wouldn’t call myself a carb-aholic, I didn’t really anticipate there being much of a withdrawal, but I think I was wrong. It’s a natural response, and I’m not liking it. I anticipate my body will adjust, and I hope it’s soon. I’d planned to only do this for two weeks, but I may have to go longer to make sure I get over whatever ‘hump’ this is and really see if there are other changes once my body fully adjusts. I suppose a month isn’t a bad timeframe, but I don’t even want to think about that right now. -Small bouts of nausea. A few times I’ve suddenly felt sick at the thought of protein sources and craved cereal or something. No actual vomiting, but an interesting mental side effect. I can’t even say I’ve had any strong carb/bread cravings, and it’s not even difficult to pass up the pretzels Andrew eats or bread on the table. I’ve had to change up my meals a bit, and while I’m not making Andrew go wheat-free, obviously I’ve had to re-think dinners, too. Breakfasts and lunches have been pretty easy and really not that different from an average day, since I already eat lots of fruits and vegetables, as well as dairy. Think smoothies and eggs for breakfast instead of a muffin or toast. Before I forget, be sure to check out my friend Emily Tunstall Frack’s blog post about Wheat Belly. She’s actually the student at Buff State who started the book club and her comments on the book are much more thorough than mine. Instead of ‘Meatless Monday,’ we did ‘Wheatless Monday.’ HA! I made a ‘wheat-free’ pizza from Wheat Belly. 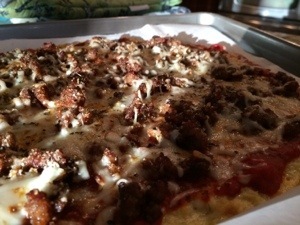 The crust is steamed and mashed cauliflower with cheese and egg, topped with traditional pizza toppings. I suppose I could have gone meatless, too, but I figured taking away Andrew’s beloved pizza crust was torture enough. 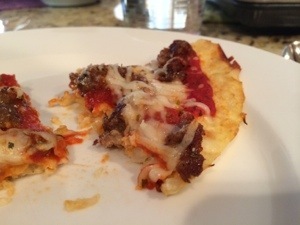 And, I thought that sausage would be an excellent flavor combo with the crust and sauce mix. The verdict: Definitely NOT pizza. In fact, I think he/we were more disappointed because we were thinking pizza…and it wasn’t. Honestly, the taste was fine. If you’d called it ‘Italian Cauliflower Pizza Bake’ or something like that, I think it would be more accurate and appealing. You can’t eat with your hands, and the ‘crust’ is a bit egg-y. I’ll be honest: Andrew was not a fan. (Not that I anticipated he’d be…) I even halved the amount of cheese in the crust and decreased the cheese and oil on top, too. Not that there will be a next time, but if there was, I’d only use one egg instead of two. You basically pour the mashed cauliflower/cheese/egg/oil mix onto a pan, bake it, then top with sauce and cheese and bake again. Good flavor, odd texture, but not pizza. 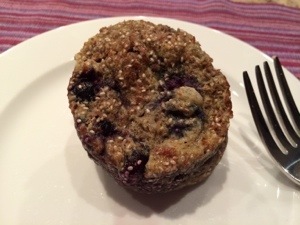 For breakfast Wednesday morning, I made LIVESTRONG’s Paleo Blueberry Muffins–in the microwave! Look! You can see the top rising out of the mug! The ‘muffin’ comes out a bit dense and certainly isn’t the crumbly, yummy blueberry muffin you imagine, but it wasn’t bad. I ended up putting in way less blueberries because I just eye-balled it and it was fine. Fewer calories, I say. 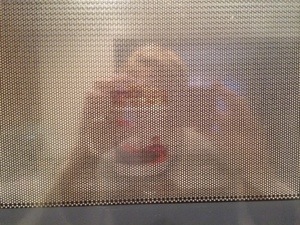 Whipping it up in the microwave was neat, too. However, it felt like a brick in my stomach on my run almost two hours later. 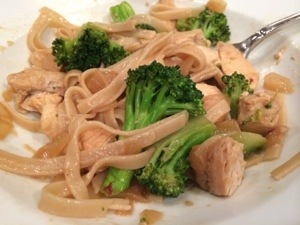 For dinner another night, I made a stir-fry from the Wheat Belly book with rice noodles. I won’t share the recipe because it was utterly taste-less (just not a great stir-fry), but the rice noodles were fine. Perhaps a slightly different taste than regular, but nothing major. For dessert for our Bible study this week, I made the Wheat Belly Cheesecake with Wheatless Crust recipe. (It was supposed to be a no-bake cheesecake using Ellie Krieger’s recipe and the WB pecan crust, until I realized the crust had an egg…so it needed to be baked. So, I threw together a combo of both recipes and threw it in the oven. It may be wheat-free, but it’s certainly not health food; it had a whopping 700 calories per slice! It’s all those nuts in the crust; the crust is made of pecans, eggs and sugar. I made my inside a bite more like EK’s, so it may have been a bit lighter, but probably not by much. Overall taste was fine, but the texture of the crust was lacking. As I was making it, the crust was almost too gooey to shape in the pan! I did finally get it up the sides of the dish and it baked just fine, but I wouldn’t recommend it. 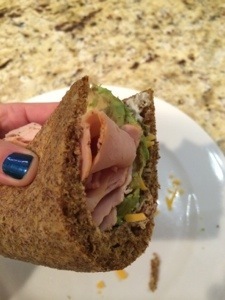 The last recipe I made this week was the Wheat Belly Flaxseed Wrap. 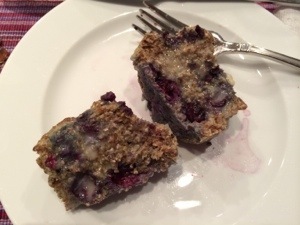 Flaxseed meal was also the main ingredient in the blueberry muffins and acts as a sort of ‘flour.’ Because the wrap is kind of high in calories (300), I cut it in half and used it for two meals. It’s another quick microwave recipe–flaxseed meal, egg, oil and spices all in a pie plate and then nuked. You could even omit the spices and throw in a little sugar and cinnamon for a breakfast wrap of sorts. I filled mine with turkey, avocado, cheese and sprouts, which is what the recipe on the next page says to do. Because the wrap is already high in protein, it’s not like you need to fill it with eggs or meat, (it was one of those nausea-inducing thoughts), but what else do you do?? I’m thinking of making the sweeter version next week and filling it with fruit and peanut butter maybe. I don’t anticipate making many more WB recipes next week, but I did want to try the Apple Walnut ‘Bread’ from the book soon. I also had my first ‘sorry I gave up wheat’ experience at a restaurant last night. We went out with friends to a place in South Buffalo for fish fry–a Buffalo tradition Andrew and I have really embraced–and I had to pass up the beer, macaroni salad and the fried fish. (Surprisingly, it was the beer I missed the most.) Thankfully, the broiled fish was excellent, as was the coleslaw. If anything, I ate a bit healthier (let’s not mention the ice cream sundae I ate later that night at Antoinette’s), drank a bit healthier, and got a taste of what those with Celiac’s Disease experience when they go out to eat. That’s part of why I’m doing this–to know what it feels like to not be able to have certain things while at a restaurant. So thankful this is only temporary. Send happy thoughts my way for week 2! Andrew and I are flying to DC this weekend to spend the holiday with my family, and we enlisted Abigail to come stay with Hadrian instead of kenneling him. My first thought was of all the goodies I could have out for our houseguest. I can’t help it. It’s the pineapple in me. However, between all of the Layers being on ‘diets’ (some more strict than others), and my unwillingness to buy what I call ‘crap,’ (gosh, that sounds harsh) you won’t find Combos or Cheetos or anything of that nature lurking around here! 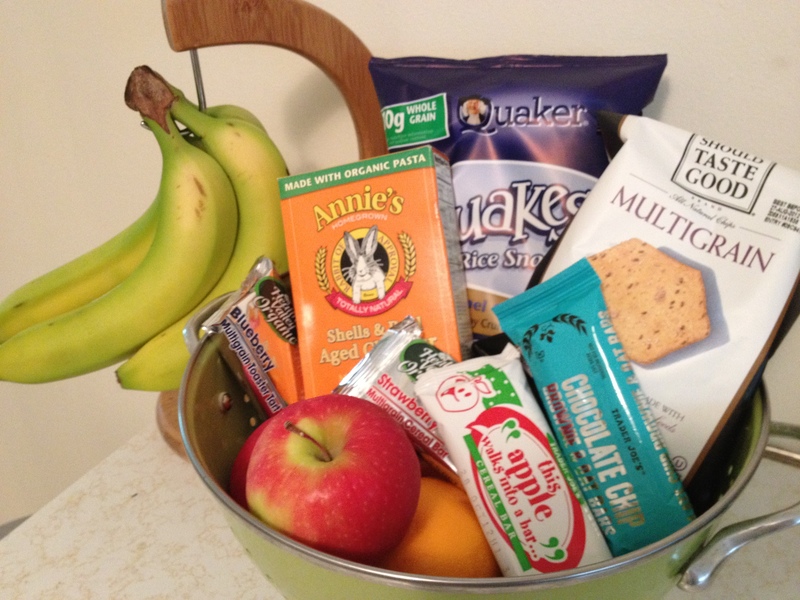 Bananas, apples and oranges, as well as a selection of pseudo-healthy cereal bars and things (just about anything is ‘healthy’ in moderation, I think), and some crunchy things like Quakes and multigrain tortilla chips. 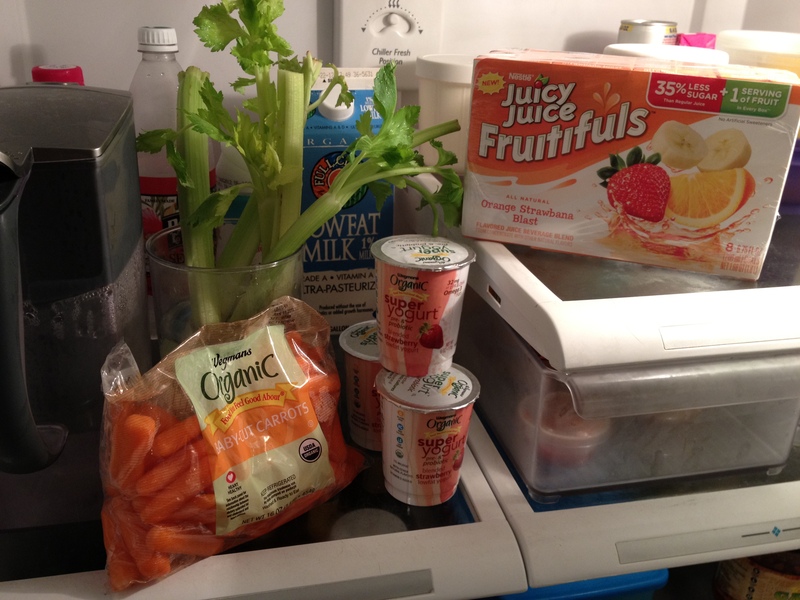 In the fridge Abigail will find celery and baby carrot sticks, as well as strawberry yogurts and 100% juice boxes. There are even goodies in the freezer! 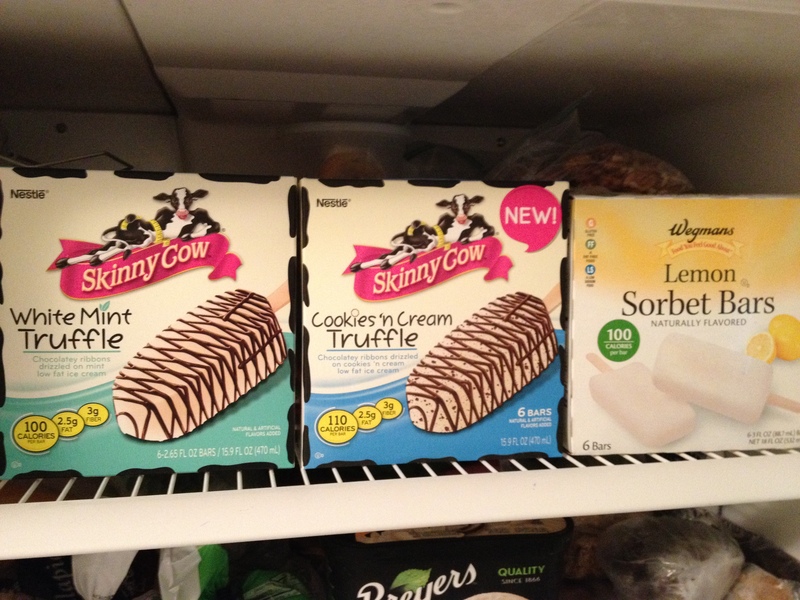 I walked down the frozen section in search of acceptable popsicles, when I came across all these Skinny Cow treats ON SALE. I tell you, it was like the White Mint bars were CALLING to me. And I know one of Abigail’s favorite flavors is cookies and cream, so I had to get both. Of course. I threw in some lemon sorbet bars thinking Andrew would like that flavor as well. 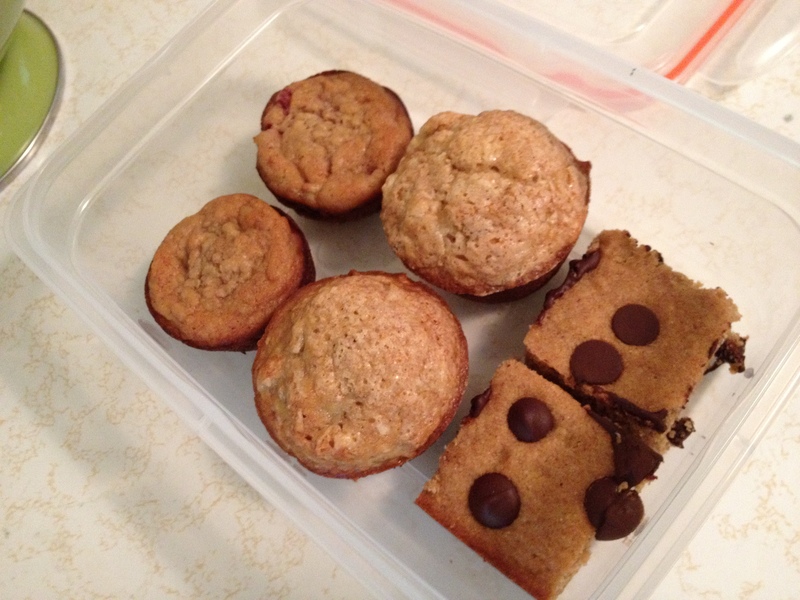 And, not to out-do myself or anything, I included a selection of the things I’ve made with the abundance of overripe bananas we’ve had on hand: strawberry-banana muffins, my banana bread with coconut and walnuts turned into muffins, and King Arthur Flour’s Chocolate-Chip Banana Squares. In making my favorite banana bread into muffins, I decided it needed to be even healthier! One and a half cups of sugar just seemed WAY. TOO. MUCH–even for two loaves–so I slashed away…again. Here is my updated page with the recipe. The muffins baked up nice and high; this is, hands down, the BEST banana bread recipe EVER. I’ll also be putting out some of Andrew’s butter-flavored microwave popcorn bags, some of my favorite mac and cheese in a box (Annie’s!) and coffee pods.